This market offers the very best of regional taste sensations, fresh flavours and value added produce . . . and wonderful musicians ! Busking @ Just Jeans & on any sunny morning with shade & seating . . . Happy people, sweet tones, international dog parade ! The frendliest chemist on earth ! JAN POWERS BRISBANE CITY FARMERS MARKET Queen St Mall near Treasury Casino Wednesdays 8 am till 4pm Enjoy local & international buskers here weekly ! ! ! Always lot’s of other fantastic performers at SE Qld markets ! ! ! Checkout my favourite harmonica maestro Juzzie Smith the best ” one man band ” busker of them all . . . 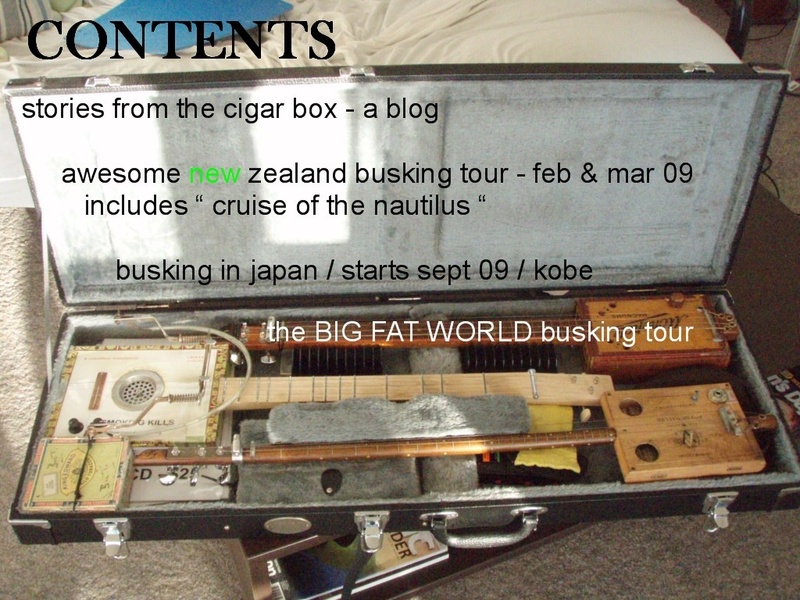 The Captain’s BIG FAT WORLD Busking Tour continues . . . since 2005 without strategy or contract . . . a pop up street show . . . It is what it is … instant fun !!! In the following pages of this blog you will find the tales of myself and other buskers working the streets, markets and fairs of Australia & New Zealand. For some reason musical instruments made from pieces of junk have a particular attraction to the listening public. There are no Britney Spears type wanna be performers on this site . . . So in a break from the monotony of finely polished factory built guitars, ukes, fiddles, drums and horns the newly awaken interest in home made instruments is much of what you will find on here. My experience of busking for a living will be shared here along with a fair bit of other stuff like surfing, sailing and life in sunny Queensland. Thanks for the visit – I hope see you at the market, on the street or on the beach ! just opened a shop in hastings st.
call by and strum and bang inside. im not allowed to do anything outside yet. peter are we going to louis theroux in Brisbane or not ? did you pay for my ticket and will be a pillion passenger on your bike or go in my car peter? Hi guys where are you Australia Day ! You post very interesting posts here. Your website deserves much more visitors. Ahoy there Carolyn – yes of course I remember you – my Gisborne visit was blessed with foul weather and good people . . . Fleet & I are old surfing buddies . . . my dad sold engine parts to the Richie brothers . . . driving to Gisborne was a real trip back down memory lane . . . my 5 weeks in NZ was a buzz . . . I am back in Queensland for a while, but soon to be heading south to play my music at some easter Festivals . . . thanks for the ” Hi ” .